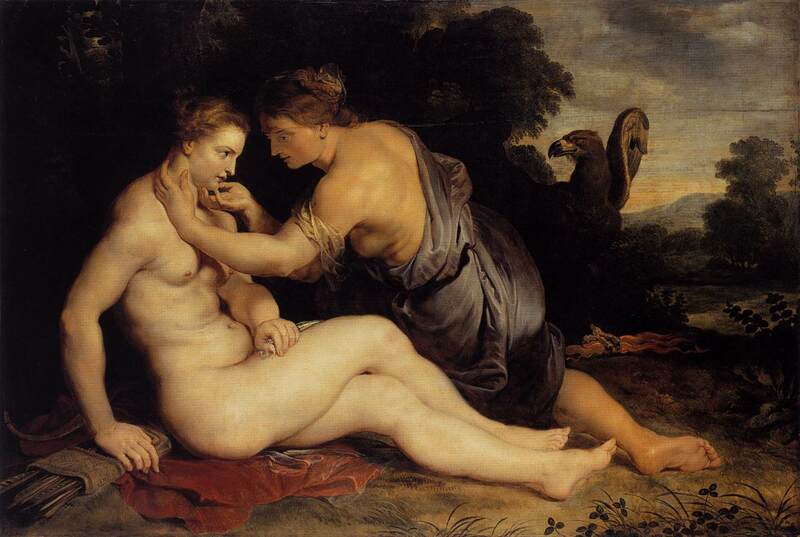 As I said in a previous post, Jupiter's attempt to seduce Callisto and the discovery of her pregnancy by Diana have proved the main focus in the story for artists. 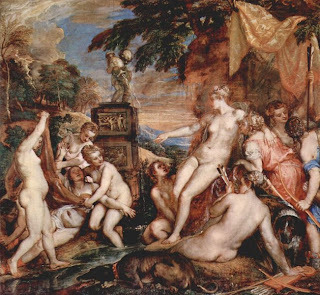 Earlier artists (in the 16th century) seem to have been more attracted to Diana's discovery of Callisto's pregnancy, while later artists (in the 18th century) seem to have been more attracted to Jupiter's attempt to seduce Callisto. The 17th century presents more of a mixture of these themes. Dosso Dossi painted the incident in 1528. The painting is now in Rome's Galleria Borghese but does not seem to be on their website. 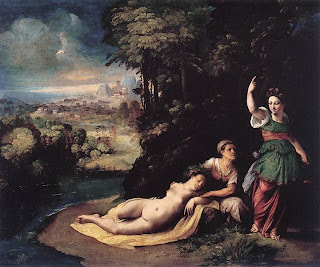 Below are two versions of the subject by Titian: the top one is from the late 1550s and is now in Edinburgh's National Gallery of Scotland while the bottom one is from 1566 and is now in Vienna's Kunsthistorische Museum. 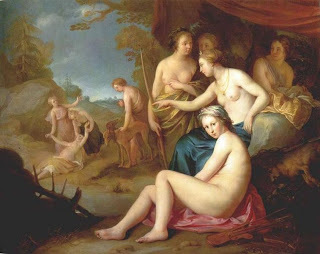 Paul Bril painted a landscape with Diana and Callisto, probably in the 1620s, while in the late 1630s Hendrick Bloemart painted this version of the scene (right). Left is a 17th century engraving by Gérard de Lairesse while below left is an engraving based on a picture from the 1740s by Jacopo Amigoni. Although many art poster and reproduction sites on the internet offer colour pictures, none of the ones I've looked at give any information as to where the original might be. 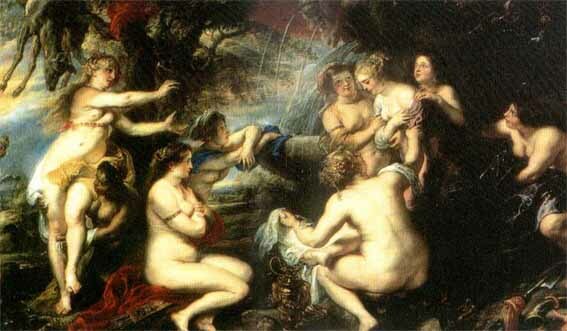 In the 17th century, Rubens had painted both Callisto in two scenes. 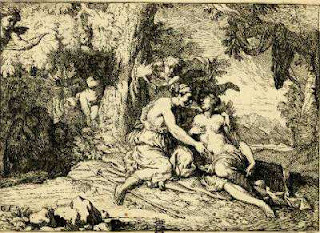 His 1613 picture Jupiter and Callisto is now in the Staatliche Museen Kassel (but not on their website as far as I can see), and Diana and Callisto in 1640 (now in the Prado, probably on their site, but they seem to actively discourage linking). 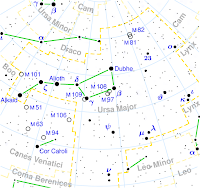 Jacob de Wit's 1727 painting now in Amsterdam's Rijksmuseum also shows Jupiter and Callisto. 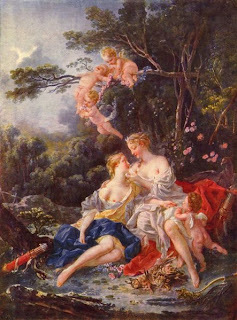 François Boucher seems to have been particularly fond of the theme of Jupiter and Callisto. This 1744 example (below, top) is now in Moscow's Pushkin Museum (not in their online collection). New York's Metropolitan Museum has another painting dated 1763, while the Wallace Collection in London has a 1769 version. 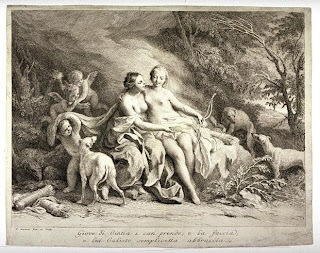 As a side note, some sites showing Boucher's Diana Leaving Her Bath (1742) (below, bottom) say that Diana's companion in the painting is Callisto, I don't know on what evidence. The Louvre's page on this picture says nothing about who she might be. Richard Wilson painted a Landscape with Diana and Callisto (now in Liverpool's Lady Lever Gallery) in 1757. The reproduction on the gallery's website is rather small, but the text is very informative. 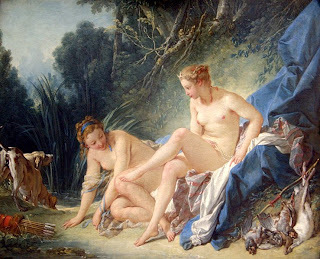 Slightly later than Boucher, Jean-Honore Fragonard produced a painting on this subject in 1778. 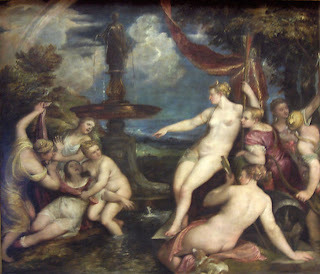 And, as a matter of national pride, don't forget Rembrandt's Diana Bathing, with the Stories of Actaeon and Callisto (1634), one of his famous all-in-one paintings; where lesser artists chose one theme, he combined the two stories into a single painting: Museum Wasserburg (but the colours are terrible).